This is a great question and one of the main reasons that we write this blog. Here are a few ideas that I have about why kids proceed with caution. Every family has different rules and sometimes moms and dad have different rules. I remember the time Thomas told me that Dad let him climb on top of the slide. I told him that he couldn’t climb on top of the slide. I also told him why. I just wasn’t in the mood to deal with the dirty looks from the other mothers in the park because he was on top of the slide. Fathers don’t routinely get those dirty looks. Nobody knows what the rules are and they change all the time. I divide kids into two categories: Monkeys and Non-Monkeys. 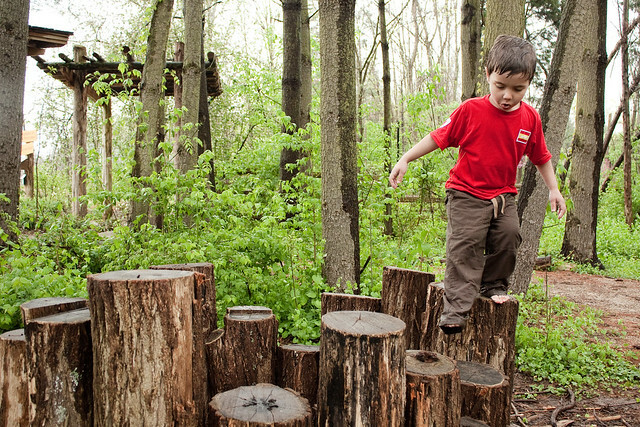 There are certain kids who have phenomenal balance and coordination. When I see these kids standing on top of the swing-set, I look and then go back to whatever I was doing. When I see non-monkeys standing on top of the swing-set, I’ll yell for them to get down. Sometimes I’ll tell the kids with high deductible insurance plans to get down, but that’s another story. Here are some ideas about how to move cautious kids ever so slightly out of their comfort zone. Risky fun doesn’t have to be over-the-top risky. Maybe it’s just holding your hand out the window of a moving car? Or exploding a two liter of pop with a roll of Mentos? It’s about baby steps. Each time you move a little further out of their comfort zone. I get right down on their level, force them to look me in the eye and give them a pep talk. It goes a little like this: You can do this. Do you trust me? Because I believe that you can do this and if I believe in you, you can do this. It’s corny but it works. When is the last time that you told a kid that you completely believed in their ability to do something? It’s a powerful message. Get off the couch and go outside. Do something cool. Ride your bike with your hands in the air. Swing too high on the swings. Whatever it takes to show your kids that it’s OK to have fun. This may only work in my family but the kids know that when we go on an adventure, if they don’t at least try it, they may be mocked. So far, I’ve never actually had to do it which is good because it will probably cost me a small fortune in therapy bills. We took one of Thomas’ friends zip-lining. I was a worried because this kid tends to be a little cautious and a tad bit afraid of heights. He assured me that he would be OK and he was … until he was all geared up and hanging from the first zipline. He declared that he wasn’t going. I did what every good parent should do and paused to see how this would play out. Our zip guide looked at him and said, “See ya!” And then he shoved him down the line. He survived and had the most fun of all the kids. I’ve never been so proud of him. My kids surprise me every day. They are bigger and stronger and braver than I could ever have imagined. It’s OK to push the limits just a little bit. Your kids know that you are there to pick them up if they don’t quite make it and that you will be proud of them for trying. What do you do to encourage a cautious child to spread their wings? I love your blog! It reminds me not to be such a worrier and to let them try things even if I’m not sure that they will end well :). Using method #2 of letting my oldest know I believe he can do it truly works with him. It works okay with my 2nd kiddo sometimes, but if she can see her brother do it first and survive, she is much more willing to try it. 🙂 She is also usually hesitant to try new things, but if I can help her the first time, and maybe the second time, she gains enough confidence to do it herself after that. Kelly, You brought up a great point. Possitive peer pressure from siblings can certainly help the more cautious kids to step up just a little. Megan, Thank you for your comment. It took a long time for my husband to loosen me up but He stuck with it and it worked.